This beautifully proportioned sapphire engagement ring features an untreated natural 1.32 carat pink sapphire highlighted by a round brilliant diamond halo and set in white gold. Our Junior Goldsmith Kayla picked this ring as one of her "Studio1098 Staff Picks" for the holiday season. Kayla believes that "This ring truly offers the best of everything. It is very elegant, stylish and attractive, with the bright, vibrant colour of the sapphire in the centre. This timeless design will be in style for many years to come and is perfect for a vibrant woman who knows her own mind." Any sapphire that isn't blue or red is categorized gemmologically as a "fancy" sapphire. While pink sapphires are probably the most in-demand of the fancies, it's still quite unusual for them to be as vibrant and as well cut as the sapphire in this pink sapphire engagement ring. Pink sapphire gets its colour from the presence of the element chromium in it's growth matrix. The more chromium that is present in the environment in which it grows, the pinker it gets. If enough chromium is present, the sapphire becomes saturated enough with colour to be classified as a ruby, and if too much is present, the sapphire gets too dark and looks black. The chromium in this sapphire makes it almost magenta coloured. There are a few things that make this pink sapphire engagement ring special. 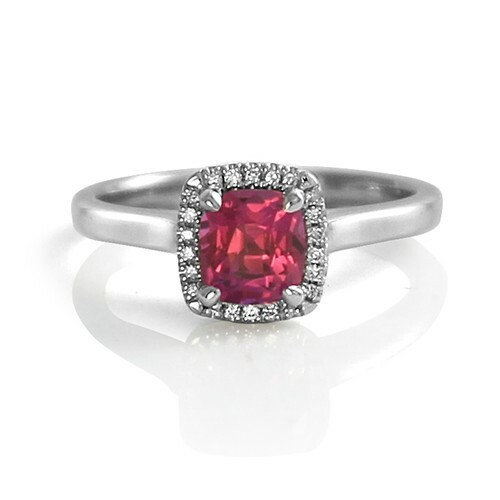 The vibrant pink of the sapphire is definitely the focal point of this very bright ring. We like the fact that there are just a few small diamonds in the halo to set it off so that the pink of the sapphire isn't overwhelmed by the diamonds - too often jewellers add so many diamonds that they compete with the centre gemstone. The fact that this sapphire is untreated is also something that makes it special. Untreated sapphires are considered to be the most valuable, but often they aren't as vibrant in their colours. We were really excited when we found a pink sapphire that was both untreated and vivacious, and are really pleased with the sapphire engagement ring we made with it.